Dunn et al. recently proposed the immunoediting hypothesis which they considered an extension of the immune surveillance theory that explained situations in which immune surveillance failed to protect the host from malignant transformation. It is obvious that, even in an immune-competent host, spontaneous tumors still develop. This means that although immune surveillance is fully functional, some tumors still escape immune detection and grow progressively. Thus, immune surveillance appeared to be an 'all or none' effect in which it either prevented or failed to prevent tumor formation. The immuno-editing hypothesis proved that this concept was wrong and demonstrated that tumor formation in the presence of immune surveillance has a profound effect on the tumor phenotype. The immunoediting hypothesis was developed when Kaplan et al. examined the immunogenicity of tumors that formed within either immuno-competent or immunodeficient mice. 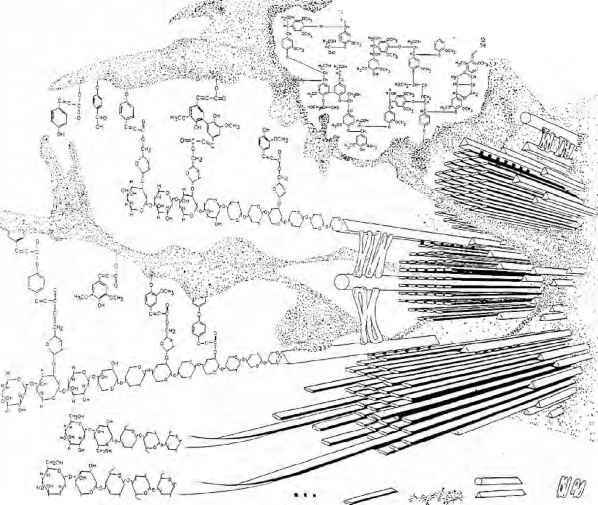 These experiments are diagramed in figure 1. As discussed earlier, there is a significant increase in the incidence of tumors that form in RAG-2 knockout mice exposed to MCA compared with normal mice exposed to the same carcinogen. A series of tumors were recovered from either normal or RAG-2 knockout mice and then injected into a second group of naïve immunocompetent mice. When the tumors recovered from normal mice were injected into the naïve recipients, 100% of the tumors grew progressively. By contrast, when the tumors recovered from RAG-2 knockout mice were injected into the naïve recipients, only 40% of the tumors grew progressively . Therefore, tumors that formed in the presence of immune surveillance were less immunogenic, and tumors that formed in the absence of immune surveillance were more immunogenic. In light of their results, they proposed that immunoediting was responsible for editing or removing tumor antigens that were recognized by immune effector cells. Fig. 1. Immunoediting of tumors that form within immunocompetent mice. 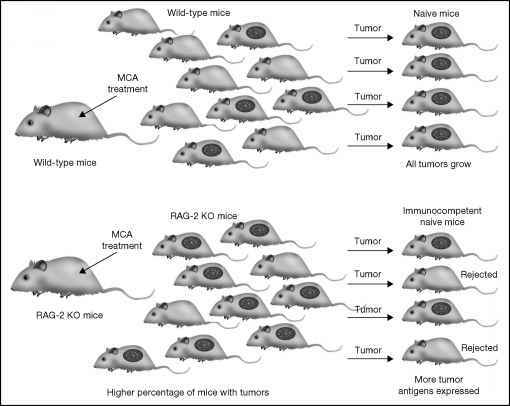 Tumors are induced in immunocompetent wild-type, or RAG-2 knockout (KO) mice by treatment with the MCA carcinogen. Tumors are recovered from the mice and injected into a second group of immunocompetent naïve mice. Tumors derived from immunocompromised mice express more tumor antigens, resulting in some tumor rejection. By contrast, tumors derived from immunocompetent mice undergo immunoediting and express fewer tumor antigens, resulting in a higher frequency of progressively growing tumors. The immunoediting hypothesis expanded the immune surveillance concept to be more than an 'all or none' effect on tumor growth. If tumors formed in the presence of immune surveillance, they expressed fewer tumor antigens than the same tumor formed in the absence of immune surveillance. This also revealed the paradox of immune surveillance; it is protective when it prevents tumor growth, but it can also promote tumor growth by making tumors less visible to the immune system. These two contradictory effects are possible because the immune effectors involved in surveillance have two functions: (i) eliminating antigen-positive tumors, and (ii) editing antigens from tumors that grow. 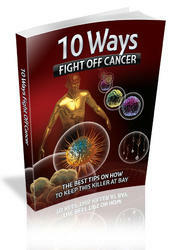 The latter function is accomplished through the mechanism of selective pressure that is applied by the immune system on the tumor cells and leads to the formation of tumor escape mutants. How a tumor is formed?